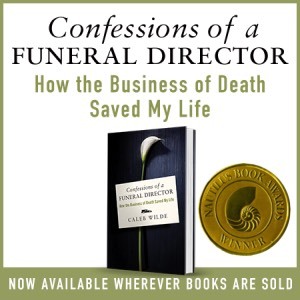 CONFESSIONS OF A FUNERAL DIRECTOR » AUTOGRAPHED BOOK GIVEAWAY! I’m giving away TEN signed copies of my book over at my ‘Confessions of a Funeral Director’ Facebook page. Here’s how you can get one. Go to my Facebook page, post a cute photo of your fur child in the comments. The TEN photos that get the MOST LIKES win an autographed copy of my book (I’ll be sure to personalize each one). The giveaway is entirely a meritocracy. So solicit your friends, solicit your relatives, maybe you can even solicit Facebook royalty like George Takei to get you likes. THE CONTEST ENDS ON FRIDAY THE 13th. So, you have a couple days to hustle your likes. Click the embedded Facebook post below to share your cute animal with the world. This entry was posted by Caleb Wilde on October 10, 2017 at 9:55 am, and is filed under Aggregate Death. Follow any responses to this post through RSS 2.0.You can leave a response or trackback from your own site.